A recent survey published by the Business and Industry Advisory Committee to the OECD (BIAC*) highlights that employers in 27 countries consider that curriculum reform should be the first priority in schools. Evidently, this emphasis is directly aligned with the Center’s core mission. 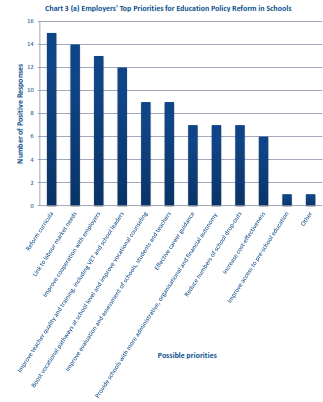 The report states: “It is interesting to note that the most commonly selected priority is school curricula reform, closely followed by linking education to labour market needs and improving co-operation with employers… it is interesting to note in Chart 3(a) that many business and employers’ organisations do wish to build closer co-operation at this level of education. Improving teaching quality and training, including VET and school leaders, is also a high priority for employers in many countries according to the survey results. *BIAC is the officially recognised representative of the OECD business community. Founded in 1962 as an independent organisation, BIAC’s members are the major business organisations in the OECD member countries and a number of OECD observer countries. Paris, 6 June 2013 – According to an international survey of national business and employers’ organisations, the private sector is calling for education systems to focus more closely on the needs of labour markets. The employers’ survey was carried out by the Business and Industry Advisory Committee (BIAC) to the OECD, and includes responses from 28 leading national business and employers’ organisations in 27 countries spanning several continents. Commenting upon the results, Mr. Attilio Oliva, Chair of the BIAC Education Committee, stated that “The high level of unemployment in many economies around the world is a painful reminder of the crucial importance of helping every person of any working age become as employable as possible – not only in the current economic period, but also for any moment in one’s future working life”. Survey responses show that it is necessary to deepen co-operation between employers, policy makers and education institutions in order to design reforms that improve education systems – in schools, higher education and vocational training. This should also be an important element of the OECD Action Plan for Youth, to which the OECD Ministerial Council committed on 29 May 2013. 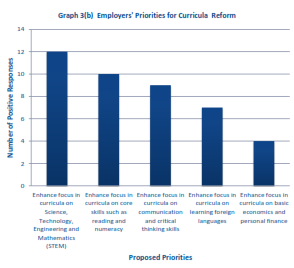 At the school-level, for example, the survey results suggest that reforming curricula is a top priority for employers. This should include increased focus on “STEM” (science, technology, engineering and mathematics), as well as skills such as reading, numeracy, communication and critical thinking, among others. “The BIAC survey reinforces the point that employers care deeply about skills and we must all work together to boost the quality of our education systems,” Mr. Oliva added. “Improving education is essential for people to find jobs, for employers to find employees with relevant skills, and for our economies and societies as a whole to thrive”.